things that you and/or your loved ones must complete in a certain amount of time. Bonus points if they're embarrassing. Once upon a time I instated a rule that for every red light the reader of said list came upon during a short road trip, one article of clothing had to be extracted. I'm not going to make you get naked (yet), but I am going to supply you with a long (and innocent) list of warm and cozy things to do between now and February. Twenty tasks, my friends. Are you up for the challenge? They're not location-specific, so feel free to add your own. Sign up below for the downloadable checklist! 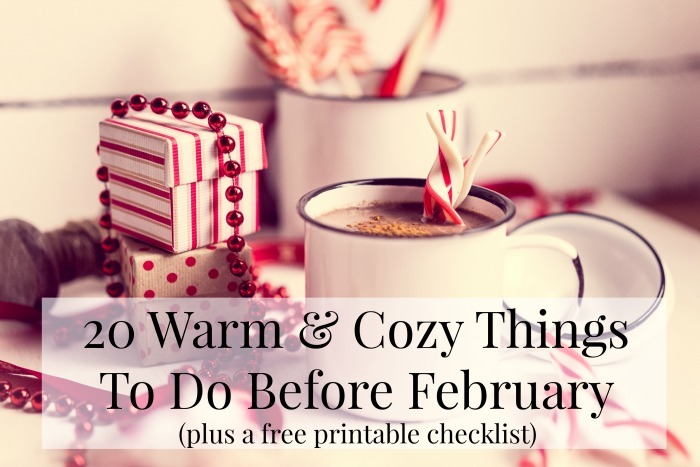 Get Your Printable Warm & Cozy Checklist! What are your favorite warm and cozy activities? I may never actually figure out how to tie a blanket scarf. love this list! We're really thinking about making a magical Christmas room/fort where we have to enter through drapes to be mystified by the lights and the tree and the amazing memories that will follow. Then we can have wine and puzzle nights under the glow of the holidays! Challenge accepted. Also, I still have my MASSIVE book of mix CDs full of cryptic designs and mix titles. One friend who always rides in the backseat likes to flip through the book whenever in my car and select a particularly embarrassing sound one for our entertainment and it's back to 2006 all over again. Good times. I'm totally making mulled wine and cooking dinner with the boyfriend tonight. Can't wait!